Adhiambo was one of the many girls at risk of being left behind. Girls are amazing and if they get the chance to have an education, we all get the chance to live in a better world. Adhiambo is just one of the many girls whose lives have been turned around as a result of the Girls' Education Challenge, launched by the UK government as a 12-year commitment to reach the most marginalised girls in the world with education. Join the movement by taking action here to speak out in support of UK aid. Exactly one year ago, on April 17, 2018, the UK government confirmed a commitment of £212 million on the Global Citizen Live stage, at O2 Academy Brixton in London. The commitment made was enough to reach 973,000 girls across the Commonwealth through the Girls’ Education Challenge, a 12-year initiative designed to reach the most marginalised girls in the world with education. To give them the chance to learn, to work, to empower themselves, and help lift their families out of poverty too. Between February 2017 and April 2018, Global Citizens tweeted, emailed, and petitioned almost 65,000 times to get the UK government to step up. And step up they did. 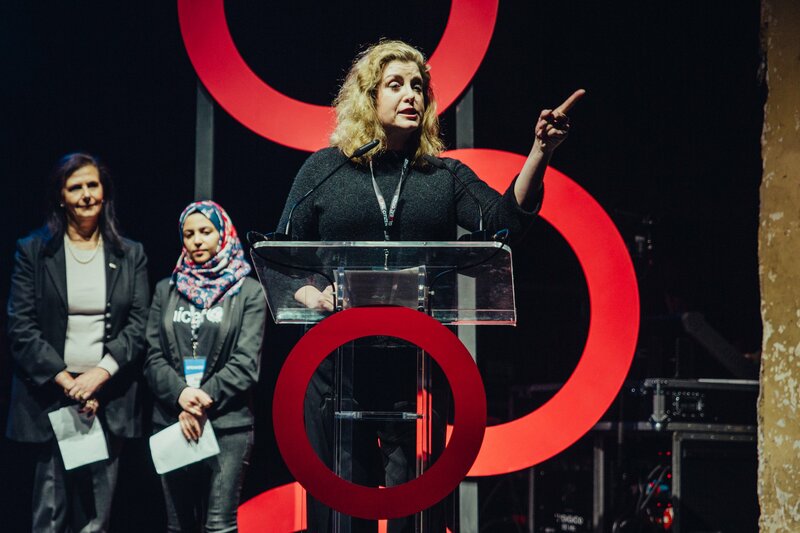 “Right now, young girls are being forced to drop out of school, and they’re not getting the same opportunities as their brothers,” Penny Mordaunt, the UK's international development minister, told the crowd of Global Citizens. The funding committed to the Girls’ Education Challenge thanks to your actions goes directly to supporting girls around the world. Girls just like Adhiambo, from Kenya. When Adhiambo was a baby she contracted polio and, while she survived, she was left with a severe physical disability. Adhiambo’s parents died when she was still very young, and so she went to live with her aunt. Then, when she was 12, Adhiambo was raped by an intruder and she had a baby. She would sit, every day in her home, not going to school and with little hope for the future. But then, one day while she was sitting with her daughter, she met a worker for UK-based charity Leonard Cheshire Disability — supported by the Girls' Education Challenge — that works to help improve the lives of people with disabilities. “He asked me if I would be interested in going to school, and I told him I was desperate to,” she continued. Thanks to that meeting, Adhiambo was finally enrolled in school and was placed under the care of a teacher called Madam Risper. “And that made me very happy, to know that finally I was with someone who was ready to help me,” she added. Thanks to Risper’s patient and understanding support of Adhiambo, she was able to watch her grow day-to-day in confidence and strength. And, with the support of UK aid funding helping to train the other teachers, soon the whole school was able to understand Adhiambo’s needs and how they could support her, too. Now, thanks to her education, Adhiambo has a reason to dream about what she wants to be in the future. So when she leaves school, she wants to train to be a tailor. Brilliantly, Adhiambo is just one of the many girls around the world whose lives are being transformed by the Girls' Education Challenge and UK aid. As part of its life-saving work in international development, the UK launched the Girls’ Education Challenge (GEC) in 2012 — to reach the girls who are most at risk of being left behind when it comes to accessing an education. The GEC is the largest global fund dedicated to girls’ education — and the aim is to transform the lives of over a million of the world’s most marginalised girls, including those, like Adhiambo, with disabilities. Currently, the GEC has 27 projects working in 15 countries — many of which have been severely impacted by conflict — including Afghanistan, Ghana, Kenya, Democratic Republic of Congo, Nigeria, Somalia, Tanzania, and Sierra Leone, among others. In Kenya, for example, where Adhiambo is from, the GEC has six different projects, all working to improve learning opportunities and outcomes for more than 341,900 of the country’s marginalised girls. It’s so important to make sure girls get an access to education — because an educated girl has the power to transform herself, her family, her community, and her country — and yet, in some regions in Kenya where poverty levels are highest, just 19% of girls are enrolled in school. There are several factors as to why that is, but many are financial. For example, families often have to pay for their own textbooks, uniforms, and teachers’ salaries, which are costs that they are unable to meet, according to the GEC. Many, like Adhiambo’s aunt, have to make difficult decisions about which child gets their education. Meanwhile, by attending school, children also aren’t contributing to their families immediate income — creating a short-term “opportunity cost.” This makes it harder for families to justify sending a child to school when they are in need of immediate income. There are also still gender equality issues, according to the GEC, with parents often not seeing how an education could benefit their daughter in a community where she is expected to marry early and be supported by her husband.